Investigating a series of violent raids by a mysterious predatory species, Captain James T. Kirk discovers that there is a startling connection with the First Federation, a friendly but secretive civilization contacted early in the USS Enterprise‘s five-year mission. After a rocky journey, the starship finds its way to the home of the First Federation, a collection of worlds hidden from the galaxy beyond. The inhabitants are wary of outsiders, and some accuse Kirk and his crew of bringing the wrath of their ancient enemy down upon them. When an attempt to stave off disaster goes tragically wrong, Kirk is held fully accountable, and Commander Spock learns there are even deeper forces that threaten this civilization. If Kirk and Spock cannot convince the First Federation’s leaders to overcome their fears, the resulting catastrophe could doom them all! There have been a lot of new novel releases in the past year in honor of Trek’s 50th anniversary. 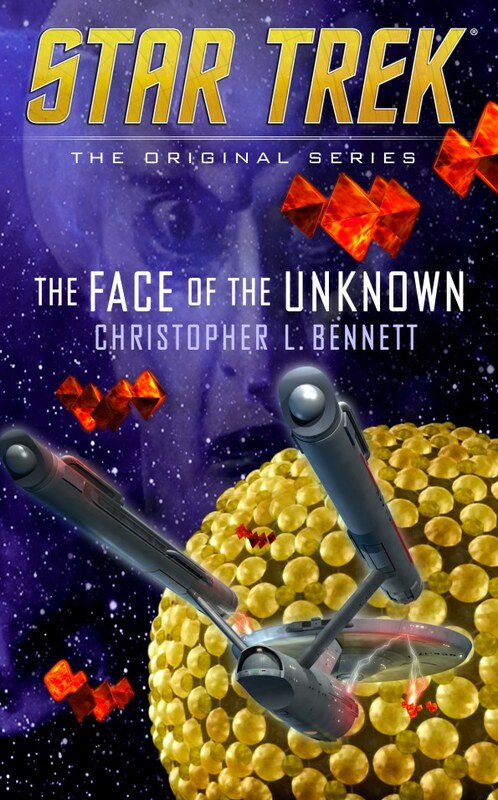 But Christopher L. Bennett’s The Face of the Unknown feels particularly celebratory. Bennett revisits “The Corbomite Maneuver,” arguably one of the best episodes of TOS (certainly, an iconic one) and the first episode of Star Trek he ever watched as a child. He expands the story of the First Federation with a healthy dose of social and political commentary, science, character development, inside jokes or references, and allusions to Trek minutiae. Also the author of the Department of Temporal Investigations series and several of the recent TNG books in the shared continuity timeline, he is quickly becoming one of my favorite Star Trek authors. Very early on, we discover the “Web of Worlds,” the home of the First Federations – a Jovian planet (gas giant, literally “Jupiter-like”) with dozens of different habitats inside its gaseous atmosphere, where each race in the First Federation has a home. This world was created as a refuge and welcomed outsiders, but over thousands of years a fear of the outside universe has created a culture of xenophobia. Furthermore, as new habitats have been added to the Web, the system has destabilized, to the brink of ecological disaster. Yet, the leadership in the First Federation refuses to believe that anything is amiss, even when presented with the facts, and instead tries to make the arrival of Kirk and the Enterprise their scapegoat. Any of this sound familiar? Plus, the Trek-science is based on real-science and that just made me happy. However, I do think that it’s a little more science-heavy that most of the TOS novels I’ve read in the past. The descriptions felt more like a TNG or VOY novel, but I like it. Another reader might just take in “They scienced the science,” during those parts but that’s ok because there is so much more going on. One of the huge advantages of media tie-in novels is that time can be spent with characters that never get much screen time. Uhura and her love of music – specifically how she views music as a form of communication – play a huge role in the storyline. Once again, we see Uhura and Spock working together, and get a glimpse of his respect and admiration for her and her work. We also get to catch up with Lt. Bailey and see how he’s matured. Bennett also throws some loving jibes at TOS, especially as we now view it by today’s standards. For example, a member of the First Federation wonders why the men on the ship wear uniforms that constrict their legs instead of the uniforms with ease of movement that the women wear. Another notes to Kirk that his crew is overwhelmingly human and overwhelming male. Kirk catches his natural instinct to respond defensively, referencing other crews in the Fleet, but then acknowledges that the Federation tries, but could do better. The novel itself even feels like an episode, up to an including the “button scene” (as I like to call them) on the bridge at the end. However, the themes of the novel echo the overarching theme in all of Star Trek: Fear is what dooms us. Reaching out and becoming more diverse is what makes us stronger. In other words: Infinite Diversity in Infinite Combinations.